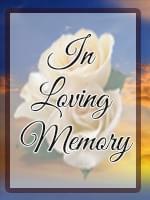 Violet Fern Parmley, 98, passed away Tuesday, September 25, 2007 in Apache Junction, AZ at Lost Dutchman Adult Care. She was born in Watervliet, MI on July 9, 1909. She married Roy D. Parmley November 11, 1925. They had four children, Marilouise (Vern) Blumer, Apache Junction, AZ, Daniel (Nancy) Parmley, Tempe, AZ and Robert (Beverly) Parmley, Michigan City, IN. She was preceded in death by her husband, Roy, in 1956 and a son, Roy, Jr., in 1995 and a daughter-in-law, Clara, in 1987. Violet has 16 grandchildren, 24 great-grandchildren and 25 great great-grandchildren. She lived in Gary, IN from 1925, moved to Hobart, IN in 1962, then moved to Apache Junction, AZ in 1993. Violet loved to sing and praise the Lord. A devoted Christian, caring, cheerful, happy person, who will be sadly missed by family and friends. Funeral services will be held at the Reese Funeral Home in Hobart, IN.